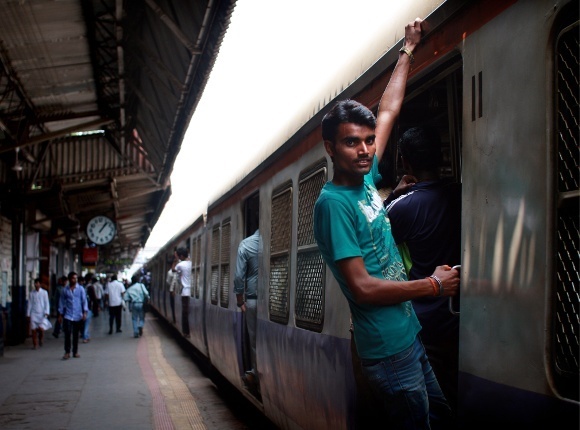 French journalists experience a day in Mumbai, Bollywood-style, visiting with the stars, watching them shoot, and becoming a part of everyday life in Mumbai’s film-crazy city that never sleeps. Earlier this month we hosted 24 journalists from France in Mumbai, home of the world’s largest film industry, so that they could understand how this massive, and magical, industry functions. They stayed at the expansive Taj Land’s End where they were greeted with flowers on their entrance: a warm welcome to what was to be a lavish stay in Mumbai. We didn’t waste any time getting straight to the action. The journalists’ first stop was Bipin Tamanna’s workshop. This experienced Bollywood costume designer gave the press crew a lowdown on how he makes filmi bling that combines speed with style, regularly managing to churn out some 200 costumes in a day! Our large bus then raced through Mumbai’s streets to arrive at Film City, the mecca of Indian film where some of the biggest-budget films of all time have been shot and produced. Our guests dropped in on different studios and witnessed shooting for some of the many small screen soap operas that have thousands in India tuned in religiously every night to watch the unfolding drama. These soaps, often featuring complex family dramas starring plotting mothers-in-law and rebellious daughters-in-law, assume prime importance in the course of people’s everyday lives. Evening visits to family, local chores, and domestic work are all planned so as not to interfere with the viewing of these riveting soaps! In true Mumbaikar style the day only speeded up as night fell: we headed out to Indigo Restaurant in Colaba to eat dinner in style, just like the stars we watched at work earlier in the day. On the way back to the hotel, we were cutting right through the city, headed north, but our bus was forced to pause by an epic annual celebration which unfurled in front of us in all its glory: the annual immersion of idols of Lord Ganesha. 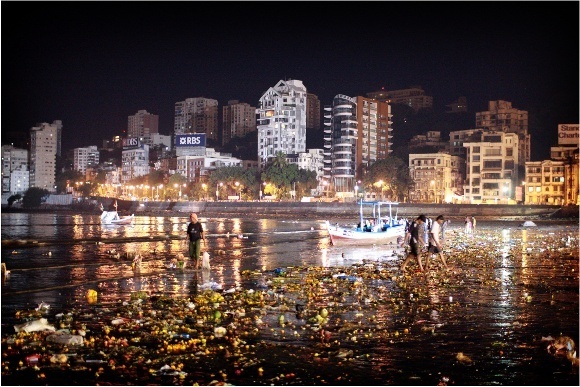 Mumbai’s long arc of beach known as Chowpatty was throbbing with thousands of devotees who chanted, prayed and offered holy food, or prasada, to our visiting guests. 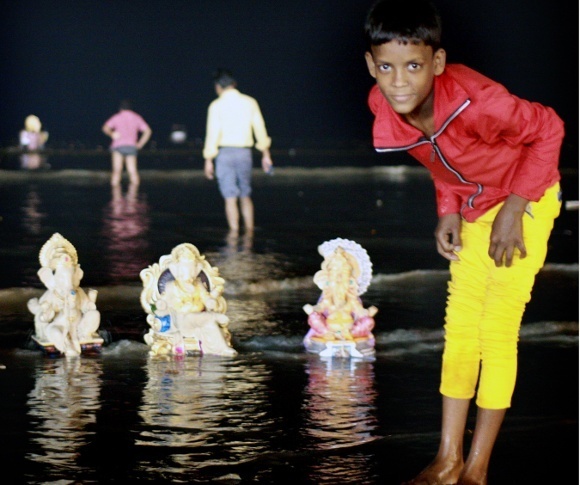 The devotees then waded into the Arabian Sea to immerse idols of the elephant-faced god, Ganesha, son of Lords Shiva and Parvati. The journalists learnt a bit about the history of this annual celebration, mingled with the massive crowds and partook of the holy offering. It was only by early morning that everyone headed to bed, exhausted but enriched. We started early the next morning with a visit to one of the largest studios in Bollywood. Yash Raj Studios produced epic love stories such as Dilwale Dulhaniya Le Jayenge (The Brave Hearted will take away the Bride) and Kabhie Kabhie (Sometimes), Dil to Paagal Hain (The Heart is Crazy). Bollywood’s backstage came alive in the next few hours in elaborate detail. The brightly-lit makeup rooms, the haze of sawdust and glitter, the moment of prayer on stage before the stage lights flash on and the show begins. The French visitors got a peek into how Bollywood creates its elaborate fantasies. The highlight of their visit to the studio was witnessing a Bollywood dance show. Song-and-dance routines are a legendary part of commercial Indian cinema. Sequences move from languid dances in between trees and plants that marked the films of the 1980s, to lavish wedding-related dances, to the beat-thumping club-themed dance sequences of contemporary commercial hits. Here the journalists were witnessing Bollywood Express, a show that brought alive the emotions of strife and joy that mark the industry. Later the press crew stayed to meet and interact with the show creator Shruti Merchant and some of the energetic dancers and performers in the show. Many young Bollywood-aspirants who arrive in Mumbai every year begin working with local dance troupes hoping to make a break with a commercial hit and the performers were fresh-faced youngsters driven by their dreams to make it in Bollywood. By the evening, high on the music and feet tapping with the rhythms, the press crew moved on to their dinner and then immersed themselves in some of Mumbai’s legendary nightlife till 4 am. The next morning we showed our guests some of the reality of everyday life in Mumbai – far from the arc lights of Bollywood. Dadar’s Fish Market was our first stop, bustling with local vendors negotiating for a good deal and trying to make early sales even before 8 am. We then moved on to Dhobi Ghat or Washerman’s Ghat, an example of a massive and wondrous system at work. Thousands of clothes are washed and ironed here everyday in an elaborate system which reaches the right clothes back to their owners. It’s a great photo opportunity as well – row upon row of brightly colored garment strung on twine, flapping in the wind. Following a tasty snack of samosas (triangular patties stuffed with spicy potatoes) and a visit to a local temple, we were rejuvenated enough to embark on our afternoon adventures. As the day peaked, we went to the city’s bustling hub: the train terminus Victoria Terminus, a massive Gothic-style building in south Mumbai where hundreds of local and national trains arrive and depart every few minutes. We walked around the charming Colaba area, exploring the precincts of the High Court, Asiatic Library, Prince of Wales Museum and the lines of street side stalls selling clothes, electronics and trinkets at throwaway prices. Through the hectic pace of the trip, some journalists managed to garner their own footage as well. One shot a documentary on the tuk-tuk (locally called an auto rickshaw). Others mingled with the crowds coming out of a movie theater, collecting vox pops on their experience of the film they’d just watched. There was also a visit with avante-garde Bollywood actor Kalki Koechlin, whose partly French ancestry made her a favorite with our visitors! After a final goodbye dinner at the Land’s End, we handed each journalist a memento of their trip to India: a pocket-sized Ganesha which can be carried everywhere, bringing good fortune. Images courtesy of Sébastien Acker.